Enjoy this freshly released NASA image of Mars taken by Curiosity rover in January from 'John Klein' stone. 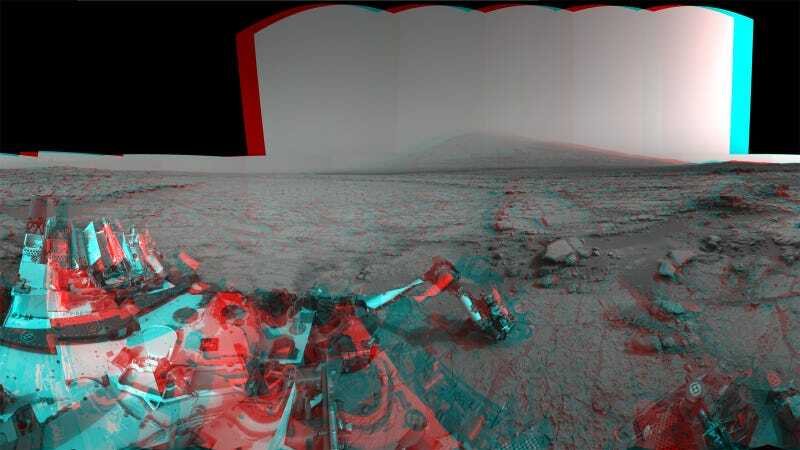 Raw Left and right eyes of the Navigation Camera (Navcam) in NASA's Curiosity Mars rover took the dozens of images combined into this stereo scene of the rover and its surroundings. The component images were taken during the 166th, 168th and 169th Martian days, or sols, of Curiosity's work on Mars (Jan. 23, 25 and 26, 2013). The scene appears three dimensional when viewed through red-blue glasses with the red lens on the left. It spans 360 degrees, with Mount Sharp on the southern horizon. In the center foreground, the rover's arm holds the tool turret above a target called "Wernecke" on the "John Klein" patch of pale-veined mudstone. On Sol 169, Curiosity used its dust-removing brush and Mars Hand Lens Imager (MAHLI) on Wernecke (see http://www.nasa.gov/mission_pages/… ). About two weeks later, Curiosity used its drill at a point about 1 foot (30 centimeters) to the right of Wernecke to collect the first drilled sample from the interior of a rock on Mars. This anaglyph was made with the images as captured by the Curiosity. Another version with the seams in the sky eliminated and cropped for optimal 3-D viewing can be seen at PIA16925.